Stolen Treasure is a three bedroom retreat located in an oceanfront complex with all the right touches for a great vacation. It is an end unit with direct boardwalk access to the community pool. Stolen treasure is in an ideal location to take advantage of all the Outer Banks has to offer. 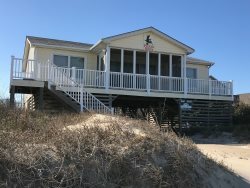 The home is located in the heart of the Outer Banks, Kill Devil Hills. Beach shops, restaurants with great local flavor, fun family attractions, and of course the beach, are all in close proximity. Some of our favorites are the Wright Brothers' museum and memorial, and Jockey's Ridge State Park The gorgeous beach is only steps away from your door! Stolen Treasure offers decks to unwind and enjoy the tranquil surroundings of the Outer Banks, and a community pool is available to your guests. The home is impeccably decorated with a warm, inviting beach theme throughout that helps to create a relaxing vacation atmosphere. Stolen Treasure is a great start to a wonderful vacation. Reserve one of the few remaining weeks today! Need more than one unit? Additional Seaside Vacations homes in the same complex: SW3, SW5, SW6, SW7, SW11, and SW17. Pool Dates 2019: May 18th - October 6th.